Accurate, modular, and supremely versatile, the AR15 is America’s favorite semi-auto rifle. But let’s face it, the AR is a maintenance hog. There are various schools of thought when it comes to maintaining an AR. Some folks prefer to run their AR “dry” with minimal lube on the lugs and friction surfaces. Other shooters prefer to run their ARs “wet”, with lots of lube. But whatever your preference, you need to clean your AR regularly. And nothing is more important that the AR’s bolt/carrier assembly. Because it is involved in feeding, firing, and extracting, the AR-15 bolt/carrier assembly can be considered the most critical portion of the AR-15 system. 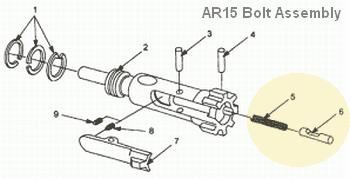 The editor of the Top Quark Blog has created an excellent illustrated AR15 Bolt Take-Down Guide that shows how to disassemble an AR15 bolt and carrier for regular cleaning. Even if you’re an experienced AR15 shooter, you can learn something from this page (sample at left), and you may want to bookmark it for future reference. The photos are large and clear and there are helpful hints for each step of the process. There is one notable oversight on this page — the author doesn’t cover disassembly and cleaning of the ejector assembly. This is actually quite important. A few small brass shavings, combined with carbon and lube in the ejector slot, WILL cause malfunctions. In fact, when this editor is called to diagnose problem ARs, the first things I look at (after swapping magazines) are the ejector recess and the slot for the extractor. Clogged ejectors are responsible for fail-to-ejects and other jams. It is essential that you keep the ejector hole clean. Old, gooey lube residues mixed with carbon and tiny brass shavings in the ejector recess will create all sorts of problems. As shown in the diagram below, it is simple to remove the ejector (#6) and ejector spring (#5), by drifting the ejector retaining pin (#4). Share the post "Good AR Bolt Take-Down Page"
This do-it-yourself project comes from ace silhouette shooter Larry Medler. He devised a hand-crank system for turning case necks that offers the best of both worlds — the speed and “muscle” of powered neck-turning with the “feel” afforded by manual methods. The flywheel, salvaged from an old grape crusher, delivers plenty of RPM when needed, but Larry still has total control over the neck-turning speed and torque. 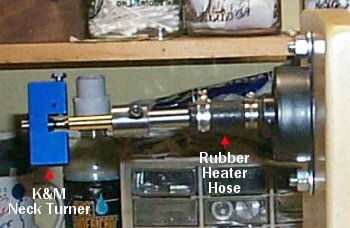 Larry explains: “My neck turner is a home-made model with a 15.5″ crank flywheel. This arrangement almost makes turning necks fun. I’ve learned that the secret to neck turning is how easy it is to turn the case. If it takes too much force or effort you’re probably not going to do a good job. However, when you turn by hand you have the best feel for the cutting process. So I wanted a system that reduced the effort required, but still retained good “feel”. My hand crank system fits the bill — it makes cutting easy, but you still have good sensitivity throughout the process. The case holder was made for 308 Winchester cartridges. The case holder fits into a rubber heater hose that connects to a 0.5-inch rod. The rod is fed through two bearing blocks which mount on a frame on my work bench. 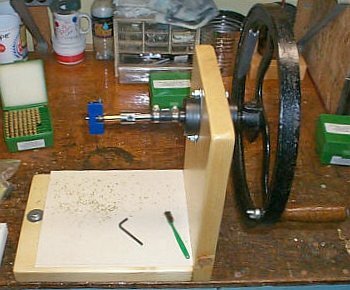 The rod is turned using a crank on the grape crusher flywheel. This system works great for neck turning. It is easy to crank and you still have a feel for how the cutter is working. While I now use an electric screwdriver to power other case prep tools, at one time I attached a variety of tools to this simple crank system. You’ll find more helpful, illustrated tips on uniforming cartridge brass on Larry Medler’s Case Prep and Loading web page. Share the post "Flywheel Hand Crank for Neck-Turning"